Pours a slightly cloudy orange-copper body topped with a finger or so of taut, off-white foam; good retention results in an expansive distribution of webby lacing, a light cap, and a frothy, bubbly collar. Aromas of raw, deep pine, evergreen, and a subtle but immovable foundation of flaky crisp malt; slight dank earth hangs in the background along with some tropical undertones; forest personified in a beer. Taste profile is evergreen and pine needles, with grapefruit zest coming in to even out the advancing, raw earthiness of it all; bits of herbal weediness follow in tow; bitter hops and a building malt punch mature with the profile as a whole. Mouthfeel is medium-bodied with a moderate, dry carbonation; vaguely bitter; coats the palate tactfully with a smooth, herbaceous grit, while simultaneously, a juicy pop grows throughout and culminates near the finish. Stiff but deceptively approachable paragon of old-school hops. I can’t speak of this beer before the Virginia expansion; I just know what I’m drinking now is one fine, expressive IPA, and I’d like to drink more of it. Poured 12oz. bottle into a JACOBI mug. Decent headage, lacing like those Christmas lights people hang from their eaves, supposedly depicting icicles. Aroma is citrusy, but not too much. Taste of aforesaid citrusy hoppage. Malty backup, ABV of 9.6 is a plus. Aftertaste lingers in the pallet, in a good way. A good beer for AA minor league snobs. Have, and would buy again. 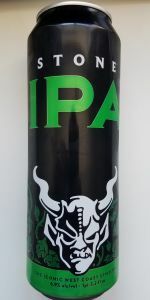 IPA | Stone Brewing. Poured from the bottle into a pint glass, this has a three finger thick off-white head, solid lacing, and a translucent deep gold body. I smell sourdough bread malts and very oily "dank" hops. The sweetness of the malts holds it down while hops reminiscent of pine, citrus, and cannabis give an appropriate bitterness. Wow, that's a nice beer! Probably one of the best IPAs out there. Ballentine's IPA (Brewer's Gold hops) will always be the best, but Stone IPA is a close second! Full bodied. Nice floral, slightly spicy bitter hops. At 6.9% - good session brew. Doesn't get much better than this.